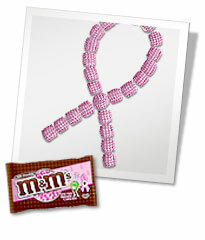 Because October is National Breast Cancer Awareness Month, M&M'S created special pink M&M'S Chocolate Candies. When you buy the specially marked bags, they'll make a donation* to The Susan G. Komen Breast Cancer Foundation. I doubt if these will be available here in Manila, but wouldn't it be great to eat pink M&M'S and support a worthy cause too! Its a statement by itself!